Ever wanted to give multiple tests to users, but you want to give them in a specific order, or perhaps only allow access to the next test, once they have passed the previous test? Show the Start link for the following test only when a user passes a test. Show the Password for the next test only when a user passes a test. When you give your tests via Links On your test "settings" page (that is: when you are assigning your test to a Link), near the bottom of the page you will see the "Test Completion" settings. Here you will find the "Pass Mark and Feedback" settings. This is where you can redirect the test-taker in the pass and fail feedback text boxes to the appropriate next Exam. Let's take a look at giving three tests. For the purpose of this example, we'll call them: Test A, Test B, Test C.
Once you have your 3 Tests created in ClassMarker, you assign them to a Link each, lets call these links: Link A, Link B, Link C respectively. You now have the 3 unique Links used for giving access to each of your 3 Tests. Now edit the "Settings" for Link A and in the "Pass Mark and Feedback" settings, you see you have a "Pass Feedback text box" (which displays only when the users passes your test), this is where you add any feedback as well as the Link for Link B, for example, "Congratulations, you have passed. To start Test B Click here." As you guessed, if they Fail that attempt, in the "Fail Feedback text box", you will add the feedback and Link to the same test they are taking, for example, "Sorry you have failed, To take Test A again: Click here." You can now do the same for Test B, Test C, Test D and so on. 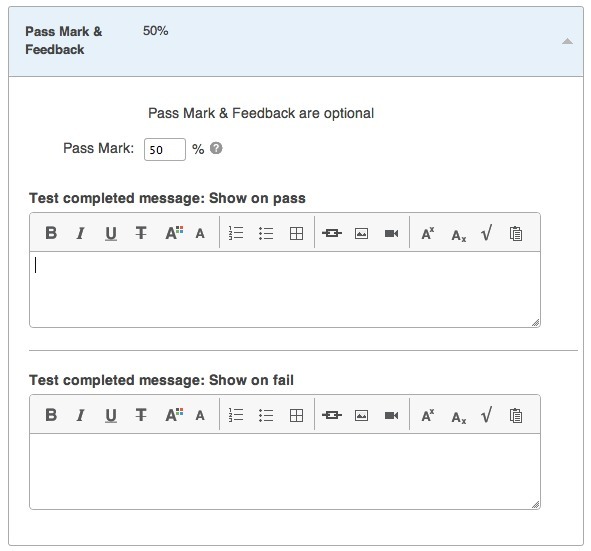 If you prefer to email out, or show all the Links to all your tests at once, then to limit access until a user has passed each previous test, you can simply add the Password for the next test in the "Pass feedback text box" which will only display after a user passes the test they are on. Now you can easily give your online exams without users being able to jump forward to the next exam until they pass the previous. Even if you are charging for your online quizzes with ClassMarker, you can set them up just as described above, with the only difference being that your users need to pay for access to the first exam, and optionally each exam after depending on your requirements. How To Sell Your Quizzes And Exams Online?